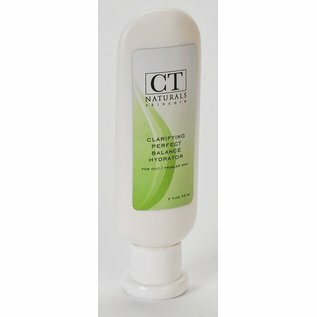 Skincare Clarifying Perfect Balance Hyd - Carol Thompson Images, Inc.
Clarifying Creme Skin Type: Oily, combination , acne prone Product Description: This feather-light, non-comedogenic gel-crème absorbs without a trace–excellent for those who dislike the feeling of moisturizer. Hydrates and seals in moisture while antioxidants and asafetida extract promote healing and help to reduce melanocyte activity in areas where old blemishes may have caused discoloration. A blend of naturally purifying essential oils keep complexion clean and clear. Client Use: After cleansing and toning, apply a small amount to face and neck and massage in gently, focusing on areas of discoloration. This lightweight creme-gel absorbs quickly and may be reapplied if desired for added moisture. Client Use: As a finishing product for clients with oily, combination or acne-prone skin, apply to face and neck and massage in gently with fingertips. Product Ingredients: Aqua (Purified Water), Stearic Acid, Glycol Distearate, Stearyl Alcohol, Aqua (and) Butylene Glycol (and) Ethoxydiglycol (and) Ferula Foetida (Asafetida) Root Extract, Cellulose Gum, C12-15 Alkyl Benzoate, Caprylic/Capric Triglyceride, Yeast Extract (Phyto Hyaluronate), Tocopheryl Acetate, 1,2-Hexanediol (and) Caprylyl Glycol (and) Tropolone, Lavandula Angustifolia (Lavender) Oil, Cananga Odorata (Ylang Ylang) Oil, Melaleuca Alternifolia (Tea Tree) Leaf Oil. pH 6.7 - 7.2 Recommendations: • A multipurpose product: antioxidants promote healing, while asafetida extract helps suppress melanocyte activity, to fade red or brown spots; lavender and teatree provide antiseptic benefits. • Light texture, not sticky or greasy, disappears on the skin yet hydrates beautifully. Ideal for those who aren’t accustomed to the feel of moisturizer • Skin that is prone to premenstrual breakout may benefit greatly from a calcium|magnesium supplement taken on a regular basis.